Thanks to the efforts of Maria Reiche the Nazca Desert is declared a national archaeological reserve and closed to visitors. So, we had to start our routes with unprotected mountainous outskirts. This proved to be a fortune that significantly shortened our path to a solution. When studying satellite images back in St. Petersburg I noticed an interesting spot on the right bank of the Ingenio river near the villages of Ingenio and Estudiantes (Students'). 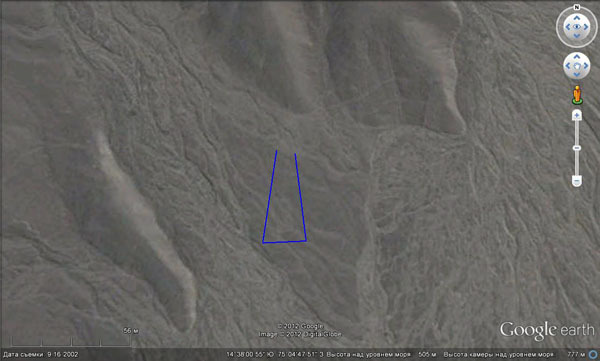 There were quite a lot of lines and other geometric geoglyphs there and it was clearly located outside the reserve. However, they were no such drawings as in the desert itself, but they did not interest me. 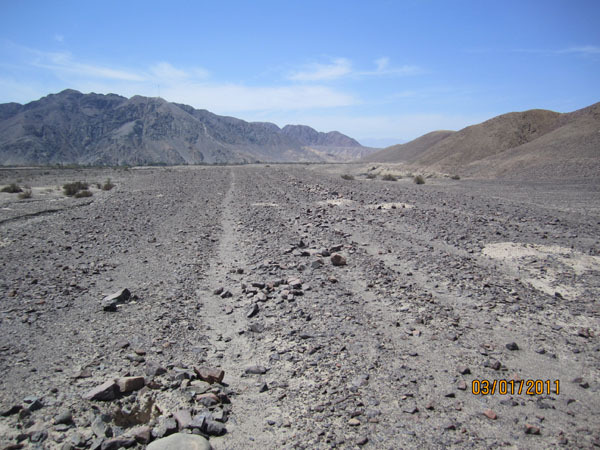 Although that this area was not guarded and was located near the settlements, mines and abandoned fields, the lines were preserved surprisingly well. They were not large but were present in almost every valley and every hill. 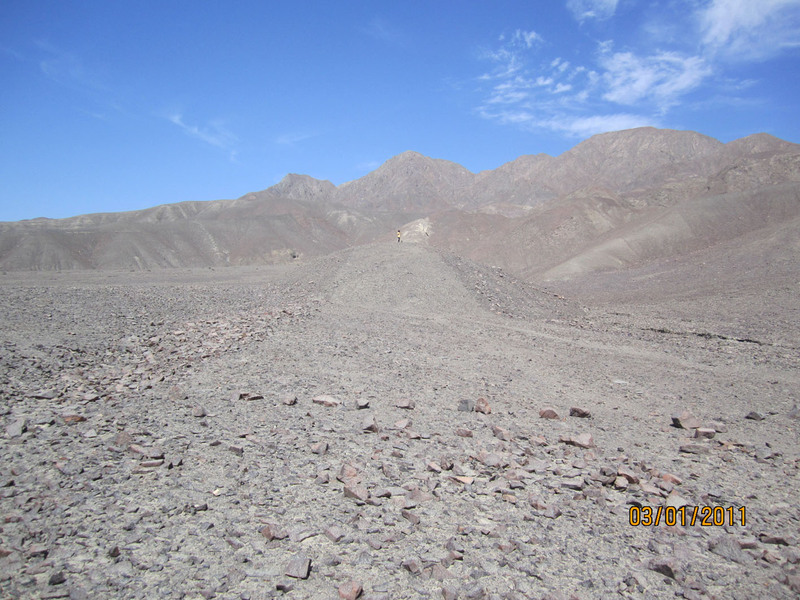 Rocky mountain slopes unlike the Nazca plains did not constitute a convenient surface for driving cars − the main destroyers of lines, and the absence of drawings kept the tourists away. 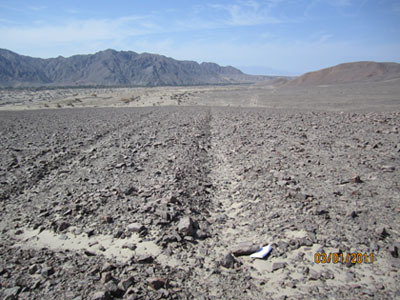 Some confusion was created by the traces of bulldozers which apparently had taked part in the development of modern fields and roads, but in most cases they were spatially separated from the geoglyphs. I decided to lay the first route to the lower part of a dry inflow of the Inhenio river located right across the village with a similar name. I expected to cross the valley and walking along the right bank to get to the northern slopes of the Ingenio valley in order to inspect the lines, which, according to the pictures, were numerous on this side of Estudiantes village. We failed to accomplish everything we had planned. Because of the heat and the fear of missing something interesting we covered a much shorter distance than I had expected, but even here we saw a lot of useful things. Our route is marked by a green line in Figure 1. Figure 1 − A general map of the area of our first route along the right bank of the Ingenio river is shown by a green line. 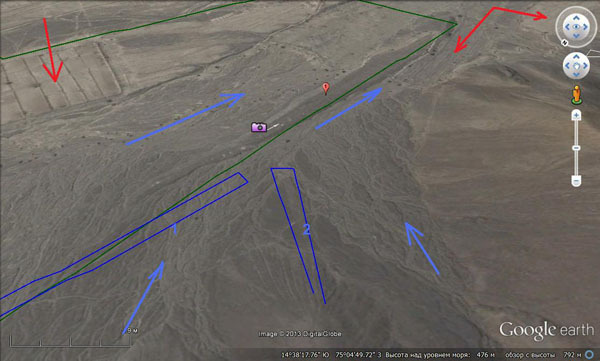 For those who are interested I recommend to have a closer look at the marks made by me in the Google Earth picture in order to develop a more holistic notion of the activities of the ancient people of the region. The first surprise was that the washouts in the valley which we had crossed turned out to be surprisingly large. Their depth was up to 2 meters, and the boards often presented formidable cliffs, so after we had climbed down we sometimes had to look for a place where we could get out of them. The washouts looked perfectly fresh. Looking at some dry and blackened cactuses and acacia bushes we could tell that the last flood seemed to happen here only a few years ago. Having crossed the valley and climbed a 10-meter high terrace attached to the hill on the right bank we (my wife, Victoria Nikitsky, and I) immediately saw the object of our quest. In Fig. 2 this place is marked with a camera sign. Victoria dispelled my doubts whether it was what we were looking for. The appearance of the lines disappointed me, I felt no awe before the great unknown. The lines represented shallow grooves, which could be divided into three groups according to their striking. First, the majority (mark 1) went in the direction of 200' to the south. Among this group was one line that was wider − it could be calles a strip. Another group went from the hill to the south-east (mark 2). And sporadic lines went in the direction of 150-160' to south-east (mark 3). The surface of the terrace was slightly decreasing in the same directions, almost coming to the level of the bottom of the valley in the south. 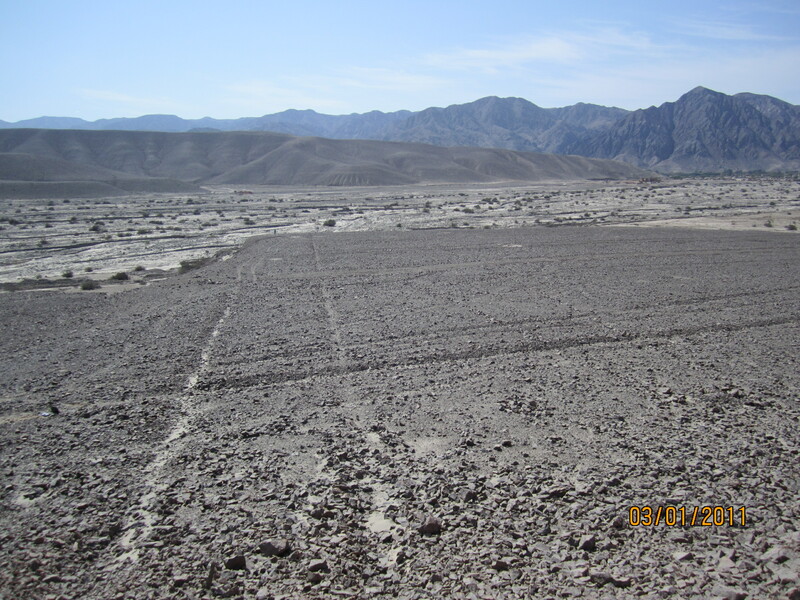 There were some fields prepared for planting. Their rib can be seen in Fig. 2 and 5. They, as we were told by Victoria, were waiting for flood. It immediately reminded me the agriculture in ancient Egypt with the Nile floods. Figure 2. The first stop is marked with a photo sign. Lines, wedges and stains. Traces of streams in the valley on the left. The ditches had a simple V-shaped profile, the width of 1m and the depth of a few tens of centimeters. Deposits that covered the terrace were presented by chip stones. The accomplishment lines as typical ditches and their position permitting the flow of water from the terrace were so common that if they were found somewhere in the flood plains of Europe I would not even pay attention taking them for regular amelioration. But there it was a desert, and there was nothing to drain, and the output of the ditches onto the above mentions fields could indicate that they were used not to remove excesses water but to collect it for irrigation. The possibility of the usage of the same land for agricultural purposes for a long period of time did not cause any doubt. On examination of chipped deposits developed on the terrace I noticed light powder filling the space between the fragments. It can be seen in Fig.3 and 4. It was unusual that it was in loose condition, hence, in the wind it filled the air with dust. It did not appear in the upper layers of stone chips, but it appeared at a depth of 10-20 cm. In some places, this dusty material reached the surface through the stone chips forming light spots of several meters in diameter. In fig. 2 I marked a couple of the brightest and largest of them with red arrows but there were more than a dozen of such spots. Figure 3. The intersection of two systems of lines. Figure 4. The line profile. For scale, in the foreground of the right photo there is a white notebook under the stone. The lines going to the south reached the edge of the terrace and stopped there. However, in the way of some lines going in the opposite direction (series 2, strike with the angle 160-340') there was a hill and it was evident that the lines were going up. In steep rubble-blocky talus with occasional rocky ledges ditches could be traced only for about ten meters and then it was lost. This also invited some questions. It was difficult to imagine how they could be passed through. The slope was very steep (with the 40 degrees angle) and slid under our feet preventing that did not allow standing, let alone working. Of course, a thought flitted across my mind: if the slope and the talus had appeared after the ditch, then its presence would have been understandable. Having taken photos and samples of the ground we went on. After 200 m to the south- west we descended from the terrace into a small valley of about 200 m wide. It had a flat smooth bottom covered with rubbly-blocky deposits like those on the terrace. It was surprising that just like the large valley, which we had just crossed, it was all cut by washouts (Fig. 5 and Fig. 8). They were smaller in size, but their appearance did not make an impression that they had been formed a long time ago. Their presence confused ​​me. 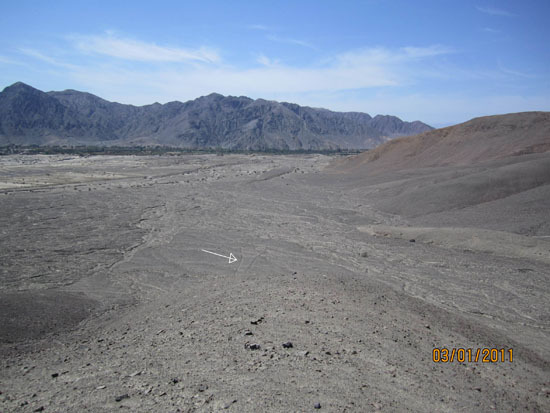 Dry river beds in the large valley seemed to be a natural thing, because the heads of this Ingenio influx were located far away in the mountains reaching the height of 3.5 km and the water from the Andes could be expected. 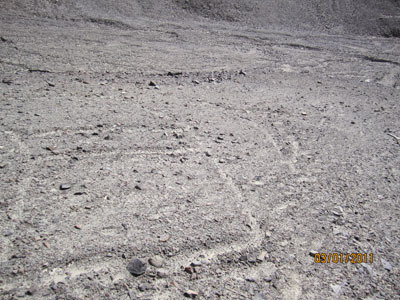 But how could such a large number of channels be formed in such hard rock in the valley of only 2-3 km long? Where did it get so much water from? It was incomprehensible. Having walked a little along the left side of the valley we came to a small elongated hill of 30 meters wide and 10 meters high (Fig. 5 and 6 marked 'Hillock'). At the very top of it there was a small ribbon that started there and was widening to the east. Victoria called it a trapeze. A close-up of it is presented in Fig. 6. On the top of a hill its width was 8 m, at the bottom it increased to 20 m. Its length was slightly less than 100 m. From east the trapeze was limited by dry washouts located under the slope of the spur. Terms like trapeze, triangle or square used sometimes to refer to such figures, in my opinion, are not very appropriate. A trapeze is characterized by two parallel bases, which are these figures usually do not have. Likewise, there are no three angles that a triangle must have. The term square generally indicates only evenness of the ground. In fact, the main thing that distinguishes these figures is slightly diverging sides that always dominate over all other elements. It is this quality that makes them more imilar to wedges which can have either a sharp or a blunt end, than to the above mentioned figures. All the more, a small angle of divergence between the sides like in the real wedge is paramount here. Hereafter, I will be using this term in order to refer to them. Despite the fact that there are many washouts around the hill, the wedge even in its lower part of almost unaffected by them. This is because it is located on a small natural elevation. This can be seen in Figures 6 , 7 and 8. Figure 5. The basin of the valley is contoured by a brown line. 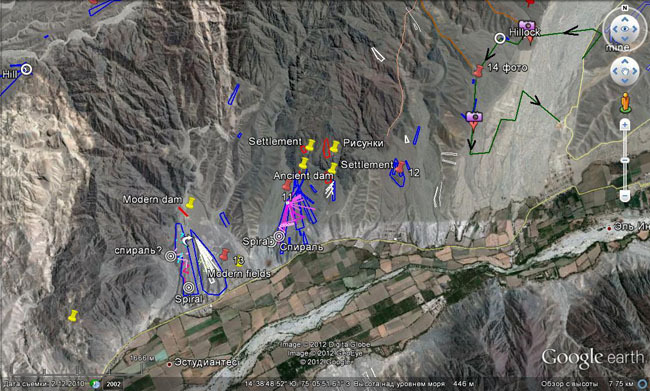 A pink line indicates the approximate boundary of the distribution of rubble cover deposits described in point 1. 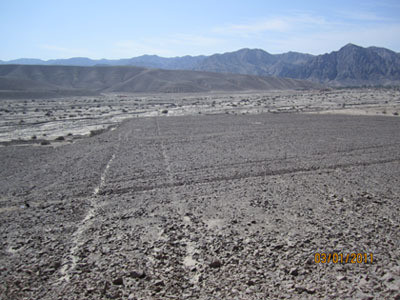 Geoglyphs are found in the field of their development. Figure 6. The hill and the wedge. Its area is cleared from the largest stones, which are assembled in low ridges on the sides. Figure 7. Victoria stands on the top of the hill, along the axis of the wedge. The lower (wide) end is marked by small lumps being staggered on the surface, as if pointing to the formality of this boundary (Fig. 7). This is a common design of the lower end of wedges, which we have seen many times. Figure 8. The view of the wedge and the bottom of the valley from the top of the hill. There are traces of streams to the right and to the left. The place we we walked was far from regular tourist routes and roads. Perhaps, this is why one interesting feature was preserved on the surface of the wedge since old times (Fig. 9 and 10). Formed by shallow grooves it was either an indication arrow or a kind of a technological V-shaped notch like those that are made on pine trees to collect resin. 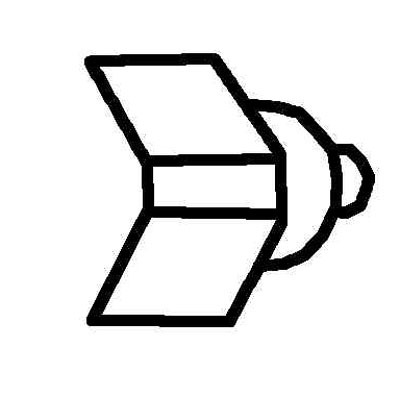 However, some would certainly interprete it as an image of an aircraft. 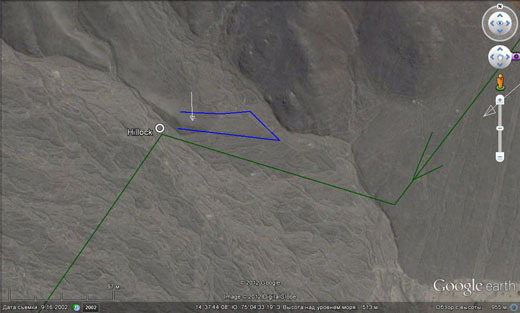 It was located just below the top, on the slope, and its 'nose' was looking down (in Fig. 6 its location is marked by a white arrow). Figure 10. The drawing on the wedge. Why not a sign of the direction of take-off? From this hill we went to the SW, crossed the valley, in which we were, and climbed a small spur of about 50 m high, covered with the same rubbly deposits that we had just seen. Standing in the watershed and looking south I noticed another small wedge below (Fig. 11). Having gone down I saw that the quality of its realization as well as its size and the principles of its location was similar to the previous one. Figure 11. An arrow indicates the wedge. In the lower half it widens. Large stones from the wedge were set as ridges on the sides, whereas riprap stone and sand-clay deposits dominated in the central part. The wedge started from the foot and was getting wider to the south. The lower part of the wedge expanded faster than the top one, making it look like a bell. In the foreground of Fig. 12 one can see the base of the wedge that is also marked by a number of small staggered lumps. The traces of erosion can be observed only in the lower left corner. The remaining area is hardly affected, because the figure, as in the previous case, is located on a barely noticeable elevation shaped as a sector (Fig. 13). Around it, as in the previous case, there are abundant traces of water streams that had cut through the dense rubble-blocky deposits. Figure 13. The view of the "bell" from above. Moving further to the south, leaving behind a long wedge on the right that was expanding down the valley, and having passed a wide ribbon (Fig.14), we came to ameridionally elongated bay-bar with a flat upper surface. It towered above the surrounding surface to the height of 1 m at the beginning and to the height of 2-2.5 m at the end and was surrounded by small steep taluses. There we saw a series of lines going to the south. One of them had a tendency to widen, turning into a narrow wedge at the end. The ​surface of the bay-bar was slightly decreasing in the same direction (from N to S). The expansion of ribbons and wedges towards lowering was already becoming a rule. Figure 14. A bay-bar with lines. Attention! Look to the NORTH. 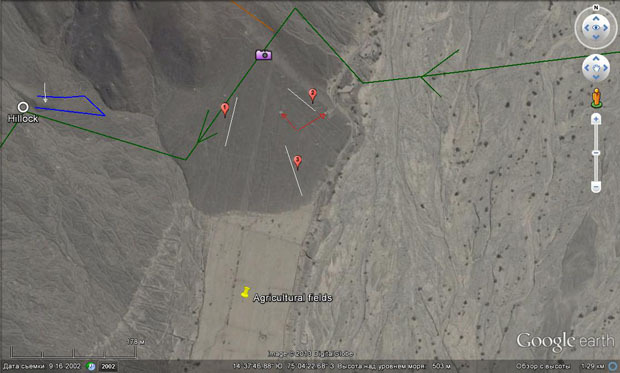 Blue arrows show the direction of the water flow. Red ones show modern fields. Numbers 1 and 2 showa ribbon and a wedge at the foot of the next ridge. A mark indicates the position and the direction in which the photo was taken in Fig.16. Except for lines there were many bright spots on the surface of the bay-bar, formed by powdery carbonate material. In Fig. 15 they are shown closely. The diameter of the spot in the foreground is about 2-3 meters, in the background it is 1m . Figure 15. Bright spots on the bay-bar. Figure 16. The lines on the bay-bar. As can be seen in Fig. 16 these lines have less contrasting cross section than the previous ones and their bottom is filled with lighter and finer material. Looking at the position of the bay-bar, the question arises. How could water get into these ditches? Even in its beginning the bay-bar has the height of about 1m and the water from the surrounding area could not flow there. Here's another chance to reflect on the restructuring of the relief. Completing the route we once again came across some fields awaiting for the flood (Fig. 14). Some withered bushes of cotton plants even survived on one of them. 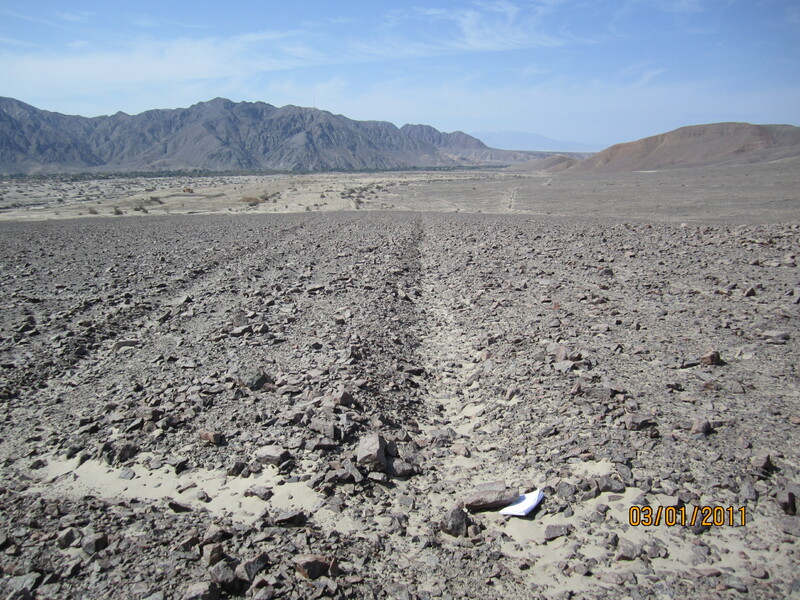 Concluding the description of what we saw in the first route it is worthwhile to say that in the vicinity of the lines we repeatedly found some shards of ancient dishes, oftenornamented, that is usually regarded as an argument in favor of ascribing geoglyphs to the Nazca culture. According to existing ideas, it covers the period from the beginning of the first millennium to the beginning of the second millennium AD. (NB: In general, shards of ceramics are widespread in the region, especially at the tops of low hills formed by rocks and sand. My wife was lucky during our the first route. In rubble-blocky talus on the left side of the dry tributary where we had gone to look around before the beginning of the route, at an altitude of 100 m above the valley she found an ancient pot broken into large fragments. 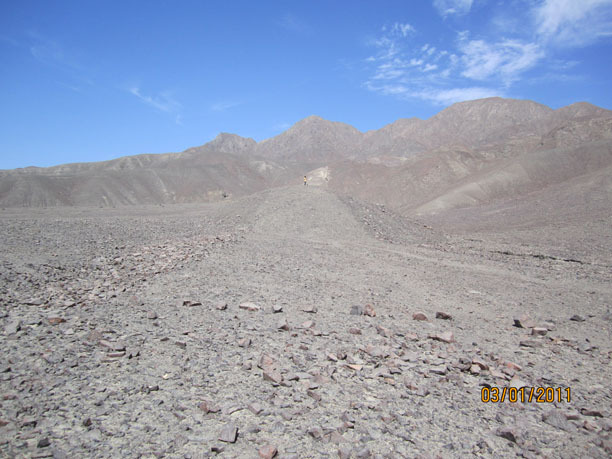 On a different occasion, near the town of Nazca, when climbing 80 m talus top of the narrow watershed with a gloomy name Venenoso (poison-snaky, author's note) almost at the very top we started finding shards. However, there were no suitable places for housing there. A narrow ridge was a jumble of boulders with pieces of ceramics between them. Archaeologists would have surely associated them with sacrifices. I explain this by the transformation of small rolling hills, which were previously inhabited by people, into the mountains covered with boulders and talus during the process of restructuring. Let us summarize of the main results of the first route. The lines and wedges were found. 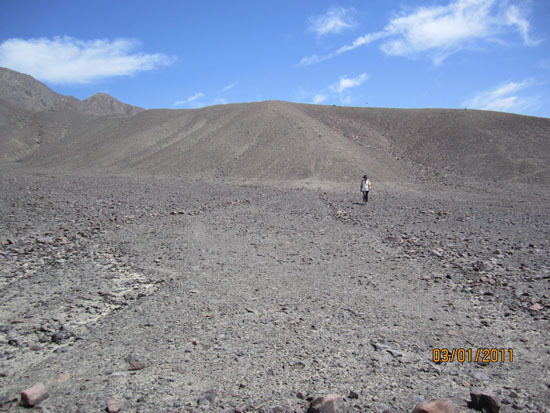 Unlike those in the desert and known to all, these were neither large in size nor of high quality, − the mountainous terrain here was not the best place for that, − there were very few flat surfaces and they were not very big. Wedges represented areas cleared of large stones and framed by ridges of stones, lines looked like shallow ditches. The direction of the lines coincided with the direction of the inclination of the slope, therefore, if they were filled with water, it could flow down. The location of wedges followed the same pattern, besides, they expanded as they were going down. It was also noted that the wedges and the lines often started either on the slopes of the elevations or at their base. Their arrangement had a characteristic duality: on the one hand, they gravitated to the valleys, which once had flowed with water, and on the other hand, it seemed like they were avoiding water being located on local elevations. The latter circumstance allowed making two very important conclusions. Firstly, the lines and wedges were designed when the streams of water were flowing in the valleys. Secondly, an ambivalent attitude towards water corresponded with the elementary principles of agriculture: arable land must be well supplied with water without being flooded. 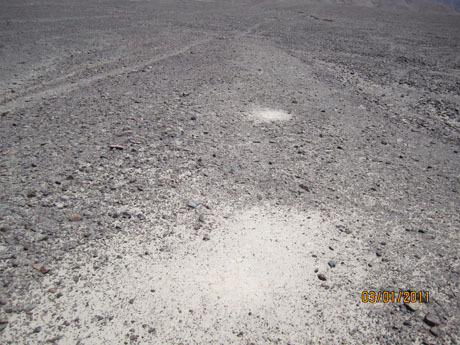 Besides, near the lines and the wedges we found many bright spots, representing areas enriched with light gray dusty material. The nature of this stuff was yet to be sorted out. 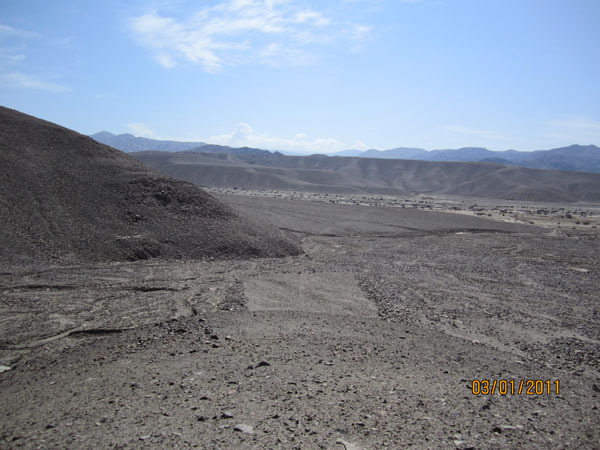 It also became clear that it was not washouts that formed valleys, but they eroded some more ancient surface having the uniformity of its cover, because the same rubble was both at the bottoms of the valleys and on the surrounding hillsides. The mismatch of the sizes of some valleys and the amount of washouts in them made me think of a possible water source. It was hard to imagine that all those washouts could be effected by showers. Being a supporter of the theory that allows the possibility of a sharp, even catastrophic transformation of the relief, I even thought that this could be the result of the release of water from the coast during its rapid rise and drainage. Later I rejected this option. It was not consistent with the abundance of channels and their wandering nature showing that the process of their formation was calmer and slower. Thus, the idea of the connection of the lines with water seemed to be confirmed so far. Indirectly it was supported by the existence of the agricultural fields located nearby. One of the main results of the first as well as the following routes was that now it became much easier to visualize things that were previously seen only in satellite photographs. 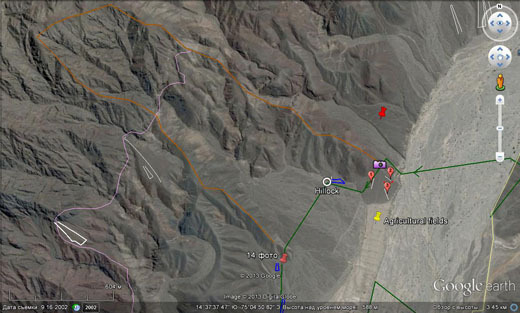 Now, armed with this new experience, let us study the satellite photographs of the area around our first route.